Tom and Ann Dugger have an unwavering belief in the power of education and the desire to help others obtain a post-secondary education. Thanks to a charitable remainder trust they established at the Oklahoma City Community Foundation, the couple can rest assured that they will be helping others earn a college degree for generations to come. 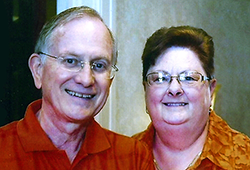 Born and raised in the northeastern part of the state, Tom and Ann both earned degrees from Oklahoma State University (OSU). They eventually made their home in Stillwater and where they raised a son who is now married and lives in Dallas. As longtime residents of the college town, the couple continue to be highly active in their community and their alma mater. Tom Dugger, a CPA, established his firm in Stillwater in 1986. He is a former member of the Oklahoma National Guard and a past Stillwater City Council member. He has served on or led numerous city, statewide and nonprofit boards including the Oklahoma Accountancy Board and the Stillwater Community Fund and is a regent for Northern Oklahoma College. In addition, he has also received many awards and accolades including being named a U.S. Small Business Advocate of the Year in 1995 and the Oklahoma Society of Certified Public Accountant's Public Service Award winner in 2002. Ann Dugger, Ed. D., retired from teaching in elementary education after 34 years and is now an adjunct professor for the School of Teaching and Curriculum Education at OSU. Over the course of 20 years Ann has led numerous education and community groups including holding the office of president for the Diamond Point Preservation Association. She also chaired the committee that helped get the one-room schoolhouse in Nowata County restored and placed on the National Register of Historic Places in 1997. "We believe that education has helped us," Tom says. "By giving to educational programs we too can help our state have a greater U.S. and international economic impact." A rental property was used to fund the charitable remainder trust with the sale proceeds providing a lifetime income stream for the Duggers. Upon their deaths, the assets will go to the Tom and Ann Dugger Fund and each year a distribution will fund scholarships at their alma mater. Charitable remainder trusts allow donors to place assets in a trust that pays annual income to a donor or a beneficiary for life or a term of years. A donor can avoid capital gains tax on the donated assets and also receive an income tax deduction for the fair market value of the remainder interest of the trust. In addition, the trust is removed from the estate, reducing subsequent estate taxes. Upon termination of the trust, the remaining assets will benefit an existing endowment or advised fund as directed by the donor. A charitable remainder trust is one of a number of trust options that the Oklahoma City Community Foundation is able to facilitate. For more information, please contact Joe Carter at 405/606-2914.